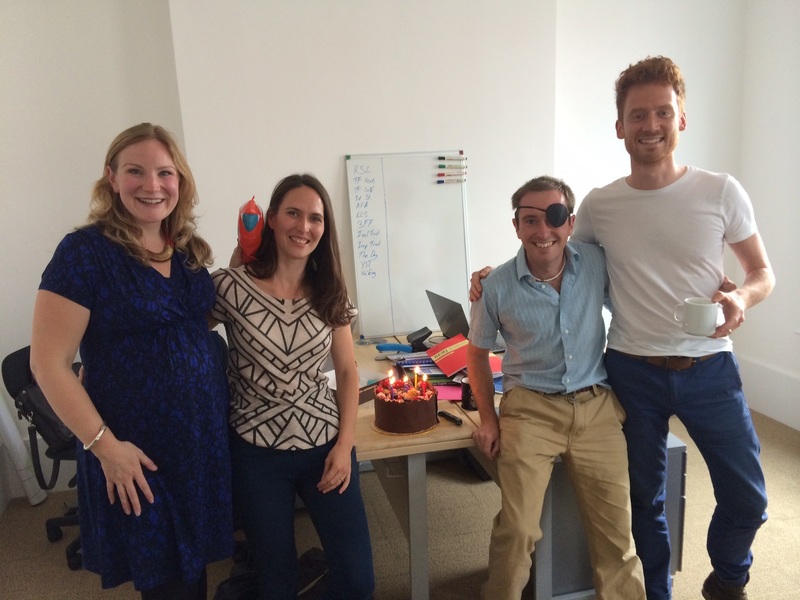 Home » Blog » General » Party like a pirate: LKMco is 5 years old today! Sat in my bedroom five years ago to the day, I registered LKMco as a company. Today, the LKMco team celebrated this big birthday by moving into our exciting new office… In a pirate ship. We’d thought about getting ourselves an office for a while and we were advised it should be in Westminster, so a few months ago we started looking. But then… I walked into a pirate ship in the middle of Hackney and fell in love. Hackney Pirates are a brilliant social enterprise providing ‘adventures in learning’ for local pupils aged 9-12. Local schools sign up and can refer 10 pupils a year; not those with the most complex needs requiring the most intensive interventions, nor those catered for by ‘Gifted and Talented’ programmes, but the oft-forgotten middle who never quite reach their potential and would benefit from extra support. The pirates attend once a week and for week long workshops in the holidays. They receive support from volunteers who read with them and help them complete writing projects with a tangible ‘product’ at the end and the aim is to improve pupils’ literacy, confidence and perseverance. Despite knowing about the Pirates for years, I hadn’t had a chance to visit the ‘Ship of Adventures’ until a month ago when I went on a tour of exciting social enterprises as part of my trustee induction at UnLtd. It was then that Catriona, the Captain (who Laura Mc and I did our teacher training with) mentioned they were renting out an office. Given just how brilliant a place it was we leapt at the chance! Our rent now goes towards funding an amazing charity- far better than paying a rich landlord. Plus, whenever someone comes to visit us, we get coffee from the cafe downstairs and that helps support their work too (so come and visit). We’ve long described ourselves as a ‘think and action’ tank (even if Sam Freedman insists “an ‘action tank’ isn’t a thing outside of GI Joe”). We don’t want to be in an academic or policy bubble; we don’t just want to have ideas; we want to be part of what’s really happening on the ground. The one thing we all complain about in our jobs is not actually getting to work directly with kids. Now we’ll see kids every day and can even pop downstairs for a spot of volunteering. Hopefully our policy, research and evaluation expertise will be useful to the Pirates (and to Street Doctors – our other friendly social enterprise neighbours). In return, they can share insights into the challenges and successes they are facing on a day to day basis. Having a Pirate Ship in the middle of Hackney is a ridiculous, bonkers thing to do. We like that and it completely fits with our style. Right now it feels like a marriage made in heaven and it’s definitely a great way of celebrating five years of LKMco. I also have an inkling it’s going to be a lot of fun! We’ll be announcing details soon of our rather exciting Ship Warming party with some brilliant speakers (and probably some rum punch). We’ll keep you posted.